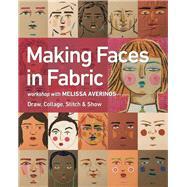 Melissa Averinos is a fabric designer, painter, and award-winning quilter. She is also a regular contributor to quilt and craft magazines. She lives on Cape Cod with her adorable husband and their two golden retrievers.